My friend was a tour guide said that many foreign tourists alone a backpack to Hanoi. Many people and only 24 hours to “live” with the city, so after leaving Hanoi they wrote on many forums, “complained” that they are almost in contact with Hanoi as a destination , but can not touch a corner of the soul of Hanoi. 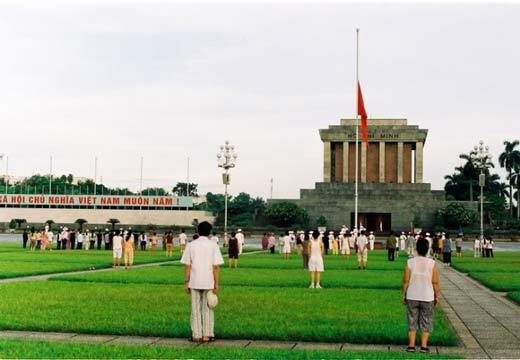 So today, if you only have 24 right now in Hanoi, I will volunteer to lead you, do you really live with the capital of my country, feel with all their senses on a city has a long thousand years old. Must get up early. 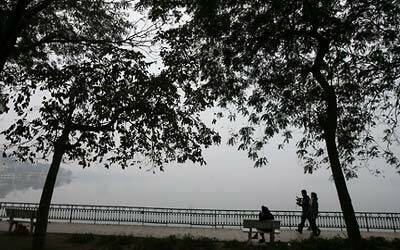 Start with an early morning routine at 4 am, I will catch you and carry you across the West Lake, where the romantic mist just like a thousand years. In the early summer, when Hanoi was not the sound by a vehicle, you will also find time to smell ethereal lotus in the breeze cool.But step into the Quang Ba flower market, you will have the opportunity to reach the heart of Hanoi. Because in this land, flower kiosk is impress point on the street, and each fresh flowers vase is always the habits of the family in Hanoi. 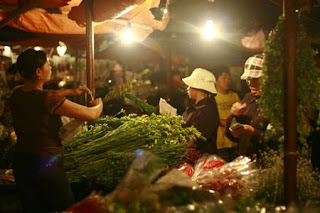 Like all other wholesale markets, the largest flower market in Hanoi, which meets at midnight, but the intervals 3, 4 is the busiest hours. The people jostle flowers, flower jostle people, call each other, laughing voice tumult. You can not do is consecutive press the camera shots. And you can chat with people year-round care for the suburban flower fields, so each morning, the flower vehicle to fit about on the streets of Hanoi, embellish for the capital a thousand years, I sure, you hardly find in other vibrant cities. 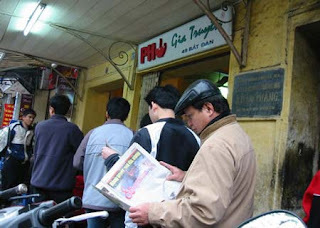 Daybreak, I’ll take you to the most famous noodle(Pho) shop in Hanoi city on Bat Dan street or Hang Dong street to taste noodle famous the world of Hanoi, watching each doorway of the Old street open to welcome a new day. 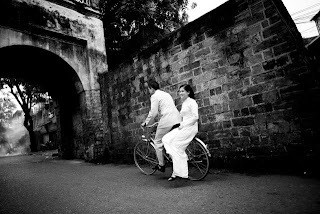 Then more wonderful if you and I mixed in along the master of the position Quarter, down the Hoan Kiem lake in the morning. I will tell you about turtle tower, the sacred Ho Guom Turtle lake has in legend, has a rare animal in the world today but there are clusters of red ear turtle invasion habitat. In the middle The Huc bridge, I’ll tell you about “special” lake of my capital. Hundreds of lakes in the city is really good examples in that little city has been. And so, people in Hanoi are very proud of the lake in the city. Then I will lead you to visit the Ho Chi Minh mausoleum. The Vietnam we used to call them by lovely names: Uncle Ho. Visit the Mausoleum is a chance for you to learn deeply about a national hero of our country who has gained worldwide recognition. If you are a lover of literature, I will take you to “explore” a winding lane in a small town Bui Xuong Trach, where the writer Nguyen Huy Thiep lived quietly for years. Nguyen Huy Thiep is one of the famous writers in Vietnam, is also the author of works translated into many languages around the world (hence, perhaps he is the writer of Vietnam has received a lot of money earnings pen unit from the foreign publishers). If you can not refuse, man and wife will invite you to eat a lunch with the vegetables in the garden of the house and stories of cultural transformation in the interesting tone slow but fascinating. If you love word painting , I’ll put you on the the Vong Thi village edge of Westlake, met Bui Hanh Can, 91 year old, who painted very special word of Hanoi. Any word or poet even an idea that Bui Hanh Be certain that draw, you will notice a surprising, unexpected to fun. If you are a lover of books, I will carry you round the Bat Dan street, where have ancient books warehouse in the heart of Old town of old teacher named Phan Trac Canh. House No. 5 is always closed the door, turning as before busy street every inch of gold ground , about … 10 tons of old books filled every corner, along the entrance stairs. Books in many different fields, there are rare special edition, like the book “Souvernirs de Hue” in French in 1867 from the author Michel Duc Chaigneau has written memories of Hue the carefully wrapped. The book “Han van tan giao khoa thu” published in 1928 and “Five natural order” in 1929 also remain intact. The owner of the “private library” was also collected books about Hanoi is quite impressive. Many foreign researchers such as Professor Yao Takao or spouses archaeologists Kikuchi Seichi and Abe Yuriko … also be looking to “house books ” thanks to him to find the books for the study. 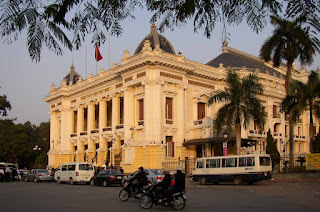 Afternoon Hanoi, I will lead you run across the Hanoi Opera House and do not forget to turn over Trang Tien street. Then I take you to the Van Mieu – Quoc Tu Giam, where I will have plenty to tell you about the traditions and history of Hanoi. March / 2010, 82 doctoral stele was built in 1484 to 1780 has been recognized as a UNESCO heritage materials in the world and every stone that has become the first world heritage site of Ha Noi. Leaving the Temple of Literature, I was driving slowly on Hoang Dieu street, and show you the simple house where Vo Nguyen Giap general lived with his family several decades. “Giap general ” – certainly the name that you know, he tied the war to protect the people of Vietnam. When the city lights up, I will join you to walk the final steps of a day in Hanoi, through the O Quan Chuong city gate – a single city gate remains have been restored to become a “stranger” . And I’ll tell you about the city gates was lost, the battles of the Army’s capital to defend every inch of land is much loved. Dinner has arrived. 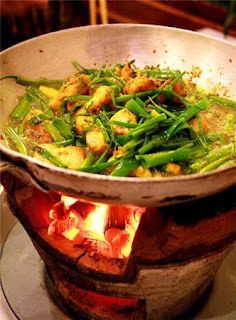 I invite you to Cha Ca (fried fish) restaurant – a place already on a list of “10 places needed before death”. Origin ups and downs of this restaurant is a story I think will surprise you there. 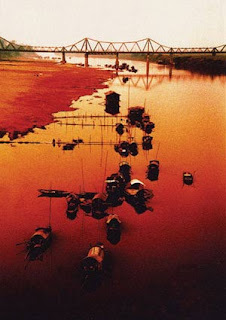 Then we’re on Long Bien Bridge – the bridge turned 100 age, became a familiar symbol of Hanoi. Just walking on the bridge, heard the Red River waves gently pat around me and to the bitter cold wind rushes typical winter Hanoi taken into the collar. I want to stop here to offer you a cup of coffee in a cafe on the Thanh Nien street, so you look back down the line the busy street. 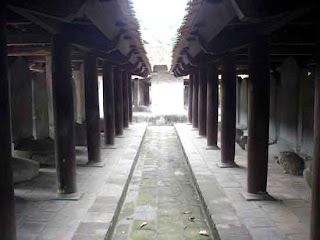 The experience in short 24 hours, I believe you have touched the depths, touching a corner of the soul and the Thang Long land.